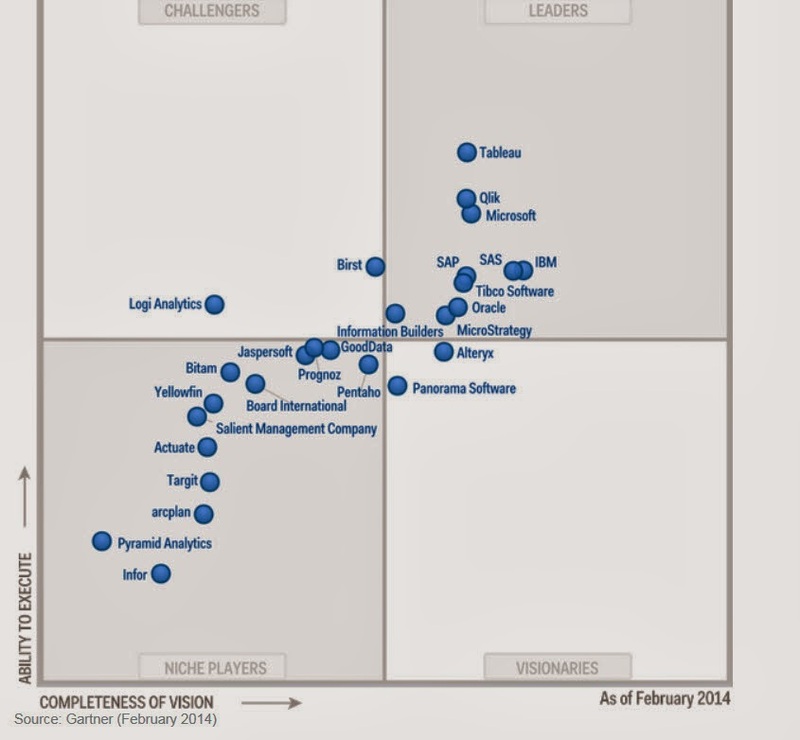 Tableau,Qilk,Microsoft,SAP,SAS,IBM,Oracle,Tibco Software,MicroStrategy and Information Builders. Since i use Microsoft suite of products the most, areas of concerns that has been listed are, Interactive visualizations, metadata management and Mobile BI support. As per the report Microsoft is trying to handle the Mobile BI space by using Power BI. Currently Microsoft BI products seemed to be most used in the Enterprise and Small business world the most. One of the challenges that Microsoft faces I feel is cross product integration, we have the traditional Microsoft BI stack on one hand, the Office/Power BI suite on the other, to add to the mix we also have Sharepoint driven BI capabilities. How do these different versions of BI products from Microsoft Co-Exist? At the same time Microsoft is depending on cloud based BI offerings to reduce complexity for smaller companies. The concerns for the above three vendors were mainly in the areas of Customer Support and sales. For Qilk as per the report there were mixed opinions about whether product is enterprise ready or not. Birst's BI platform is primarily a cloud-based offering. It includes a broad range of components, such as data integration, federation and modeling, a data warehouse with a semantic layer, reporting, dashboards, mobile BI and a recently announced interactive visualization tool. GoodData is a cloud BI and analytics specialist. It provides a range of front-end BI capabilities and packaged analytic applications that complement its comprehensive cloud and on-premises source data integration and cloud-based data warehouse platform.